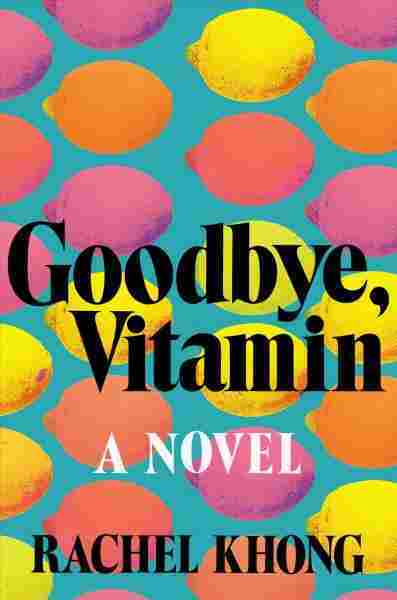 Book Review: 'Goodbye Vitamin' By Rachel Khong Rachel Khong's first novel is a heartwarming account of family devotion and dementia — which sounds sickly, but her offbeat sensibility and flair for wordplay keep the story from becoming saccharine. A heartwarming book about Alzheimer's disease? Seriously? Rachel Khong's first novel comes adorned with rows of hot pink, orange, and yellow lemons, but a pitcher of lemonade would have been apt too, for this is a writer who clearly knows how to squeeze the sweetness out of the tart fruit life throws at you. We meet Khong's winsome narrator, 30-year-old Ruth Young, when she goes home for Christmas for the first time in years, after her fiancé — for whom she dropped out of college to accompany him to medical school — dumps her for another woman. Her father, Howard, a history professor, has been diagnosed with Alzheimer's, and her flummoxed mother asks her to stay home and help for a year. When a stranger calls to say he's found her father's newly labeled pants and shirts hanging from trees up and down the road, Ruth realizes she "can't not stay." So Goodbye, Vitamin is about getting over a bad breakup and reconnecting with family. But it's also about a devoted father who went into a tailspin — involving booze and an affair — when his adored firstborn left home, a situation that was exacerbated when Ruth stayed away after hearing her younger brother's distressing reports. Most of all, though, it's about memory and forgiveness, and the realization that both are selective, subjective, and unpredictable. But I'm making it sound too heavy. This is a much sunnier take on dementia care than, say, Alice Sebold's grim The Almost Moon, in which a resentful daughter suffocates her severely demented mother, or even Lisa Genova's empathetic, neurobiologically informative Still Alice. Khong's endearingly quirky novel, which takes the form of Ruth's diary of her transitional year, is filled with whimsical observations, oddball facts, and yes, even some romance. The title comes from Ruth's mother's new faith in vitamins, and her father's habit of bidding them adieu before tossing them down the hatch. Ruth spends a lot of time reading message boards on caregiver forums, inventing new yoga poses, and preparing meals that feature brain food like jellyfish and cruciferous vegetables — which her father calls "crucified." (Khong's work as a food writer and editor shows.) Still, she wonders, "What do I do all day? I don't even know." Most of all ... [Goodbye, Vitamin] is about memory and forgiveness, and the realization that both are selective, subjective, and unpredictable. The novel captures the painful disorientation that follows a blindsiding breakup, as Ruth stews over the waste of so many years. Her training as a maternity ultrasound sonographer provided no help in reading their stagnant relationship, and she's furious with her own cluelessness. But even as she moves on, troubling memories occasionally wash up "out of nowhere—like an ancient candlestick from some wrecked ship." And how's this for a great line: "You know what else is unfair, about Joel? That I loosened the jar lid, so somebody else could open him." Meanwhile, her father slips in and out of rationality — sometimes running off without clothes or leaving an avocado shell in the dish rack as if it were a freshly washed plate, other times lecturing cogently on California history to a devoted group of graduate students who have come up with an elaborate, screwball ruse to "keep his mind off, well, losing it" by pretending he's been reinstated to his academic position. Some passages evoke the wonderful offbeat sensibility of Ali Smith, channeling the Scottish writer's flair for clever wordplay and adorable interchanges, especially between children and adults. In Howard's more lucid moments, he shares a notebook in which he recorded Ruth's pearls of wisdom when she was little. "Today we went over to your mother's friend's house for dinner. We'd asked you to be polite, so you said, 'No more, please, it's horrible thank you,'" reads one entry. Even cuter: "Today was my birthday, and you asked me how old I was. When I told you 35 you seemed stunned. You asked me if I started at one. Then you asked, When do we die?" During the course of Ruth's homecoming year, their roles switch and she starts cataloguing her father's erratic days: "Today I cooked salmon and you said it was esculent," she writes. "Today you disappeared again, and scared the s--- out of us." As she charts their family pulling together in moments of stress, hilarity, and tenderness, she comments, "Here I am, in lieu of you, collecting the moments." Sweet? Yes. Sugarcoated? Perhaps. Saccharine or cloying? Not to me. Hello, Rachel Khong. Kudos for this delectable take on familial devotion and dementia.